Estimates of the casualties from the conflict in Iraq (beginning with the 2003 US invasion of Iraq, and the ensuing occupation and insurgency) have come in many forms, and the accuracy of the information available on different types of Iraq War casualties varies greatly. Estimates of Iraq War casualties range from 151,000 violent deaths as of June 2006 (per the Iraq Family Health Survey) to 461,000 total deaths as of June 2011 (per PLOS Medicine 2013), over 60% of them violent. Other estimates, which are disputed in the scientific community, such as the 2006 Lancet study and the 2007 Opinion Research Business (ORB) survey put the numbers as high as 655,000 total deaths as of June 2006 (over 90% of them violent) and 1.2 million violent deaths as of August 2007 respectively. Body counts — which underestimate mortality — counted at least 110,600 violent deaths as of April 2009 (Associated Press). The Iraq Body Count project documents 183,249 – 205,785 violent civilian deaths through Feb. 2019. The tables below summarize reports on Iraqi casualty figures. Overview: Iraqi death estimates by source Summary of casualties of the Iraq War. Possible estimates on the number of people killed in the invasion and occupation of Iraq vary widely, and are highly disputed. Estimates of casualties below include both the 2003 invasion of Iraq and the following Post-invasion Iraq, 2003–present. Classified US military documents released by WikiLeaks in October 2010, record Iraqi and Coalition military deaths between January 2004 and December 2009. The documents record 109,032 deaths broken down into "Civilian" (66,081 deaths), "Host Nation" (15,196 deaths),"Enemy" (23,984 deaths), and "Friendly" (3,771 deaths). The Health Ministry of the Iraqi government recorded 87,215 Iraqi violent deaths between January 1, 2005, and February 28, 2009. The data was in the form of a list of yearly totals for death certificates issued for violent deaths by hospitals and morgues. The official who provided the data told the Associated Press said the ministry does not have figures for the first two years of the war, and estimated the actual number of deaths at 10 to 20 percent higher because of thousands who are still missing and civilians who were buried in the chaos of war without official records. Associated Press stated that more than 110,600 Iraqis had been killed since the start of the war to April 2009. This number is per the Health Ministry tally of 87,215 covering January 1, 2005, to February 28, 2009 combined with counts of casualties for 2003–2004, and after February 29, 2009, from hospital sources and media reports. For more info see farther down at The Associated Press and Health Ministry (2009). The Iraq Body Count project (IBC) figure of documented civilian deaths from violence is 183,249 – 205,785 through February 2019. This includes reported civilian deaths due to Coalition and insurgent military action, sectarian violence and increased criminal violence. The IBC site states: "it should be noted that many deaths will probably go unreported or unrecorded by officials and media." Iraq Family Health Survey for the World Health Organization. On January 9, 2008, the World Health Organization reported the results of the "Iraq Family Health Survey" published in The New England Journal of Medicine. The study surveyed 9,345 households across Iraq and estimated 151,000 deaths due to violence (95% uncertainty range, 104,000 to 223,000) from March 2003 through June 2006. Employees of the Iraqi Health Ministry carried out the survey. See also farther down: Iraq Family Health Survey (IFHS, 2008). Opinion Research Business (ORB) poll conducted August 12–19, 2007, estimated 1,033,000 violent deaths due to the Iraq War. The range given was 946,000 to 1,120,000 deaths. A nationally representative sample of approximately 2,000 Iraqi adults answered whether any members of their household (living under their roof) were killed due to the Iraq War. 22% of the respondents had lost one or more household members. ORB reported that "48% died from a gunshot wound, 20% from the impact of a car bomb, 9% from aerial bombardment, 6% as a result of an accident and 6% from another blast/ordnance." The United Nations reported that 34,452 violent deaths occurred in 2006, based on data from morgues, hospitals, and municipal authorities across Iraq. The Lancet study's figure of 654,965 excess deaths through the end of June 2006 is based on household survey data. The estimate is for all excess violent and nonviolent deaths. That also includes those due to increased lawlessness, degraded infrastructure, poorer healthcare, etc. 601,027 deaths (range of 426,369 to 793,663 using a 95% confidence interval) were estimated to be due to violence. 31% of those were attributed to the Coalition, 24% to others, 46% unknown. The causes of violent deaths were gunshot (56%), car bomb (13%), other explosion/ordnance (14%), airstrike (13%), accident (2%), unknown (2%). A copy of a death certificate was available for a high proportion of the reported deaths (92% of those households asked to produce one). The PLOS Medicine study's figure of approximately 460,000 excess deaths through the end of June 2011 is based on household survey data including more than 60% of deaths directly attributable to violence. The estimate is for all excess violent and nonviolent deaths. That also includes those due to increased lawlessness, degraded infrastructure, poorer healthcare, etc. 405,000 deaths (range of 48,000 to 751,000 using a 95% confidence interval) were estimated as excess deaths attributable to the conflict. They estimated at least 55,000 additional deaths occurred that the survey missed, as the families had migrated out of Iraq. The survey found that more than 60% of excess deaths were caused by violence, with the rest caused indirectly by the war, through degradation of infrastructure and similar causes. The survey notes that although car bombs received more significant press internationally, gunshot wounds were responsible for the majority (63%) of violent deaths. The study also estimated that 35% of violent deaths were attributed to the Coalition, and 32% to militias. Cardiovascular conditions accounted for about half (47%) of nonviolent deaths, chronic illnesses 11%, infant or childhood deaths other than injuries 12.4%, non-war injuries 11%, and cancer 8%. Concerning war-related deaths (civilian and non-civilian), and deaths from criminal gangs, Iraq's Health Minister Ali al-Shemari said that since the March 2003 invasion between 100,000 and 150,000 Iraqis had been killed. "Al-Shemari said on Thursday [November 9, 2006] that he based his figure on an estimate of 100 bodies per day brought to morgues and hospitals – though such a calculation would come out closer to 130,000 in total." For more info see farther down at Iraq Health Minister estimate in November 2006. 268,000 - 295,000 people were killed in violence in the Iraq war from March 2003 - Oct. 2018, including 182,272 - 204,575 civilians (using Iraq Body Count's figures), according to the findings of the Costs of War Project, a team of 35 scholars, legal experts, human rights practitioners, and physicians, assembled by Brown University and the Watson Institute for International and Public Affairs, "about the costs of the post-9/11 wars in Iraq and Afghanistan, and the related violence in Pakistan and Syria." The civilian violent death numbers are "surely an underestimate." From June 2003, through December 31, 2010, there have been 16,623 Iraqi military and police killed based on several estimates. The Iraq Index of the Brookings Institution keeps a running total of ISF casualties. There is also a breakdown of ISF casualties at the iCasualties.org website. From June 2003, through September 30, 2011, there have been 26,320-27,000+ Iraqi insurgents killed based on several estimates. 136 journalists and 51 media support workers were killed on duty according to the numbers listed on source pages on February 24, 2009. (See Category:Journalists killed while covering the Iraq War.) 94 aid workers have been killed according to a November 21, 2007, Reuters article. Graph of monthly deaths of U.S. military personnel in Iraq from beginning of war to June 24, 2008. As of June 29, 2016, according to the U.S. Department of Defense casualty website, there were 4,424 total deaths (including both killed in action and non-hostile) and 31,952 wounded in action (WIA) as a result of the Iraq War. As a part of Operation New Dawn, which was initiated on September 1, 2010, there were 73 total deaths (including KIA and non-hostile) and 295 WIA. See the references for a breakdown of the wounded, injured, ill, those returned to duty (RTD), those requiring medical air transport, non-hostile-related medical air transports, non-hostile injuries, diseases, or other medical reasons. As of 23 October 2011[update], hostile-fire deaths accounted for 3,777 of the 4,799 total coalition military deaths. See Multinational force in Iraq. Contractors. At least 1,487 deaths between March 2003 and June 2011 according to the list of private contractor deaths in Iraq. 245 of those are from the U.S. Contractors are "Americans, Iraqis and workers from more than three dozen other countries." 10,569 wounded or injured. Contractors "cook meals, do laundry, repair infrastructure, translate documents, analyze intelligence, guard prisoners, protect military convoys, deliver water in the heavily fortified Green Zone and stand sentry at buildings – often highly dangerous duties almost identical to those performed by many U.S. troops." A July 4, 2007, Los Angeles Times article reported 182,000 employees of U.S.-government-funded contractors and subcontractors (118,000 Iraqi, 43,000 other, 21,000 U.S.). 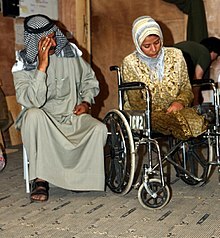 The Human Rights Ministry of the Iraqi government recorded 250,000 Iraqi injuries between 2003 and 2012. The ministry had earlier reported that 147,195 injuries were recorded for the period 2004–2008. Iraqi Government spokesman Ali al-Dabbagh reported that 239,133 Iraqi injuries were recorded by the government between 2004 and 2011. Classified US military documents released by WikiLeaks in October 2010, recorded 176,382 injuries, including 99,163 civilian injuries between January 2004 and December 2009. The Iraq Body Count project reported that there were at least 20,000 civilian injuries in the earliest months of the war between March and July 2003. A follow up report noted that at least 42,500 civilians were reported wounded in the first two years of the war between March 2003 and March 2005. The United Nations Assistance Mission for Iraq (UNAMI) reported that there were 36,685 Iraqi injuries during the year 2006. The Health Ministry of the Iraqi government reported that 38,609 Iraqi injuries had occurred during the year 2007, based on statistics derived from official Iraqi health departments' records. Baghdad had the highest number of injuries (18,335), followed by Nineveh (6,217), Basra (1,387) and Kirkuk (655). "4 bombings in Baghdad kill at least 183. ... Nationwide, the number of people killed or found dead on Wednesday [, April 18, 2007, ] was 233, which was the second deadliest day in Iraq since Associated Press began keeping records in May 2005. Five car bombings, mortar rounds and other attacks killed 281 people across Iraq on November 23, 2006, according to the AP count." Graph of monthly wounded in action of U.S. military personnel in Iraq. 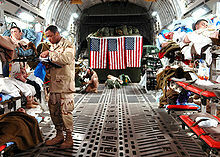 As of January 12, 2007, 500 U.S. troops have undergone amputations due to the Iraq War. Toes and fingers are not counted. 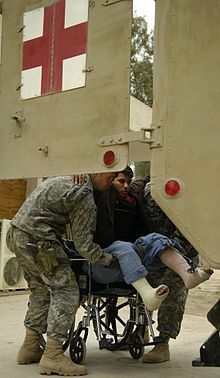 As of September 30, 2006, 725 American troops have had limbs amputated from wounds received in Iraq and Afghanistan. A 2006 study by the Walter Reed Medical Center, which serves more critically injured soldiers than most VA hospitals, concluded that 62 percent of patients there had suffered a brain injury. In March 2003, U.S. military personnel were wounded in action at a rate averaging about 350 per month. As of September 2007, this rate has increased to about 675 per month. "More than one in four U.S. troops have come home from the Iraq war with health problems that require medical or mental health treatment, according to The Pentagon's first detailed screening of service members leaving a war zone." As of November 4, 2006, the United Nations High Commissioner for Refugees estimated that 1.8 million Iraqis had been displaced to neighboring countries, and 1.6 million were displaced internally, with nearly 100,000 Iraqis fleeing to Syria and Jordan each month. Franks reportedly estimated soon after the invasion that there had been 30,000 Iraqi casualties as of April 9, 2003. That number comes from the transcript of an October 2003 interview of U.S. Defense Secretary Donald Rumsfeld with journalist Bob Woodward. They were discussing a number reported by The Washington Post.[when?] But neither could remember the number clearly, nor whether it was just for deaths, or both deaths and wounded. A May 28, 2003, Guardian article reported at the Close the Iraq War of 5 Years, One Million Killed in Sectarian Strife "Extrapolating from the death-rates of between 3% and 10% found in the units around Baghdad, one reaches a toll of between 13,500 and 45,000 dead among troops and paramilitaries. An October 20, 2003, study by the Project on Defense Alternatives at Commonwealth Institute in Cambridge, Massachusetts, estimated that for March 19, 2003, to April 30, 2003, the "probable death of approximately 11,000 to 15,000 Iraqis, including approximately 3,200 to 4,300 civilian noncombatants." The Iraq Body Count project (IBC) documented a higher number of civilian deaths up to the end of the major combat phase (May 1, 2003). In a 2005 report, using updated information, the IBC reported that 7,299 civilians are documented to have been killed, primarily by U.S. air and ground forces. There were 17,338 civilian injuries inflicted up to May 1, 2003. The IBC says its figures are probably underestimates because: "many deaths will probably go unreported or unrecorded by officials and media." A soldier carries a wounded Iraqi child into the Charlie Medical Centre at Camp Ramadi, Iraq (March 20, 2007). An independent UK/US group, the IBC project compiles reported Iraqi civilian deaths resulting from the invasion and occupation, including those caused directly by coalition military action, the Iraqi insurgency, and those resulting from excess crime. The IBC maintains that the occupying authority has a responsibility to prevent these deaths under international law. Iraq Body Count project data shows that the type of attack that resulted in the most civilian deaths was execution after abduction or capture. These accounted for 33% of civilian deaths and were overwhelmingly carried out by unknown actors including insurgents, sectarian militias and criminals. The Iraq Body Count project (IBC project), incorporating subsequent reports, has reported that by the end of the major combat phase up to April 30, 2003, 7,419 civilians had been killed, primarily by U.S. air-and-ground forces. It shows a total range of at least 183,249 – 205,785 documented civilian deaths from violence in Iraq through February 2019. The continually updated IBC database page those numbers come from says: "Gaps in recording and reporting suggest that even our highest totals to date may be missing many civilian deaths from violence." This total represents civilian deaths due to war-related violence that have been reported by media organizations, non-governmental-organization-based reports, and official records. The IBC project has been criticized by some who believe it counts only a small percentage of the number of actual deaths because of its reliance on media sources. The IBC project's director, John Sloboda, has stated, "We've always said our work is an undercount, you can't possibly expect that a media-based analysis will get all the deaths." However, the IBC project rejects many of these criticisms as exaggerated or misinformed. Concerning the yearly totals, IBC project states: "All figures are taken from the "maximum" confirmed deaths in the IBC database. However, IBC's rates and counts will rise over the coming months, as data is still being added to the IBC database for 2006 and other periods covered here." The IBC project released a report detailing the deaths it recorded between March 2003 and March 2005 in which it recorded 24,865 civilian deaths. The report says the U.S. and its allies were responsible for the largest share (37%) of the 24,865 deaths. The remaining deaths were attributed to anti-occupations forces (9%), crime (36%) and unknown agents (11%). It also lists the primary sources used by the media – mortuaries, medics, Iraqi officials, eyewitnesses, police, relatives, U.S.-coalition, journalists, non-governmental organizations (NGOs), friends/associates and other. The Iraq Body Count (IBC) project has recorded the numbers of civilians killed in violence since the 2003 invasion of Iraq based on a "comprehensive survey of commercial media and NGO-based reports, along with official records that have been released into the public sphere. Reports range from specific, incident based accounts to figures from hospitals, morgues, and other documentary data-gathering agencies." The IBC was also given access to the WikiLeaks disclosures of the Iraq War Logs. The Iraq Body count has been criticized by a number of scholars and studies for underestimating the death toll. According to a 2013 Lancet article, the Iraq Body Count is "a non-peer-reviewed but innovative online and media-centred approach that passively counted non-combatant civilian deaths as they were recorded in the media and available morgue reports. In passive surveillance no special effort is made to find those deaths that go unreported. The volunteer staff collecting data for the IBC have risked criticism that their data are inherently biased because of scarcity or absence of independent verification, variation in original sources of information, and underestimation of mortality from violence... In research circles, random cross-sectional cluster sampling survey methods are deemed to be a more rigorous epidemiological method in conflict settings." Following are the yearly IBC Project violent civilian death totals, broken down by month from the beginning of 2003. The Iraqi political party People's Kifah, or Struggle Against Hegemony (PK) said that its survey conducted between March and June 2003 throughout the non-Kurdish areas of Iraq tallied 36,533 civilians killed in those areas by June 2003. While detailed town-by-town totals were given by the PK spokesperson, details of methodology are very thin and raw data is not in the public domain. A still-less-detailed report on this study appeared some months later on Al Jazeera's website, and covered casualties up to October 2003. Roughly 40 percent of Iraq's middle class is believed to have fled, the U.N. said. Most are fleeing systematic persecution and have no desire to return. All kinds of people, from university professors to bakers, have been targeted by militias, Iraqi insurgents and criminals. An estimated 331 school teachers were slain in the first four months of 2006, according to Human Rights Watch, and at least 2,000 Iraqi doctors have been killed and 250 kidnapped since the 2003 U.S. invasion. Since the official handover of power to the Iraqi Interim Government on June 28, 2004, coalition soldiers have continued to come under attack in towns across Iraq. 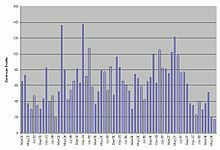 National Public Radio, iCasualties.org, and GlobalSecurity.org have month-by-month charts of American troop deaths in the Iraq War. A U.S. Marine killed in April 2003 is carried away after receiving his Last Rites. The combined total of coalition and contractor casualties in the conflict is now over ten times that of the 1990–1991 Gulf War. In the Gulf War, coalition forces suffered around 378 deaths, and among the Iraqi military, tens of thousands were killed, along with thousands of civilians. See the overview chart at the top of the page for recent numbers. On August 29, 2006, The Christian Science Monitor reported: "Because of new body armor and advances in military medicine, for example, the ratio of combat-zone deaths to those wounded has dropped from 24 percent in Vietnam to 13 percent in Iraq and Afghanistan. In other words, the numbers of those killed as a percentage of overall casualties is lower." Many U.S. veterans of the Iraq War have reported a range of serious health issues, including tumors, daily blood in urine and stool, sexual dysfunction, migraines, frequent muscle spasms, and other symptoms similar to the debilitating symptoms of "Gulf War syndrome" reported by many veterans of the 1991 Gulf War, which some believe is related to the U.S.'s use of radioactive depleted uranium. A study of U.S. veterans published in July 2004 in The New England Journal of Medicine on posttraumatic stress disorder (PTSD) and other mental disorders in Iraq and Afghanistan veterans found that 5 percent to 9.4 percent (depending on the strictness of the PTSD definition used) suffered from PTSD before deployment. After deployment, 6.2 percent to 19.9 percent suffered from PTSD. For the broad definition of PTSD that represents an increase of 10.5 percent (19.9 percent – 9.4 percent = 10.5 percent). That is 10,500 additional cases of PTSD for every 100,000 U.S. troops after they have served in Iraq. ePluribus Media, an independent citizen journalism collective, is tracking and cataloging press-reported possible, probable, or confirmed incidents of post-deployment or combat-zone cases in its PTSD Timeline. Information on injuries suffered by troops of other coalition countries is less readily available, but a statement in Hansard indicated that 2,703 U.K. soldiers had been medically evacuated from Iraq for wounds or injuries as of October 4, 2004, and that 155 U.K. troops were wounded in combat in the initial invasion. Leishmaniasis has been reported by U.S. troops stationed in Iraq, including visceral leishmaniasis. Leishmaniasis, spread by biting sand fleas, was diagnosed in hundreds of U.S. troops compared to just 32 during the first Gulf War. As of August 2008, sixteen American troops have died from accidental electrocutions in Iraq according to the Defense Department. One soldier had been electrocuted in a shower, while another had been electrocuted in a swimming pool. KBR, the contractor responsible, had been warned by employees of unsafe practices, and was criticised following the revelations. Ted Koppel, host of ABC's Nightline, devoted his entire show on April 30, 2004, to reading the names of 721 of the 737 U.S. troops who had died thus far in Iraq. (The show had not been able to confirm the remaining sixteen names.) Claiming that this would constitute a political statement, the Sinclair Broadcast Group took the action of barring the seven ABC network-affiliated stations it controls from airing the show. The decision to censor the broadcast drew criticism from both sides, including members of the armed forces, opponents of the war, MoveOn.org, and most notably Republican U.S. Senator John McCain, who denounced the move as "unpatriotic" and "a gross disservice to the public". As of January 18, 2007, there were at least 500 American amputees due to the Iraq War. The amputees represent 2.2% of the 22,700 U.S. troops wounded in action (5% for soldiers whose wounds prevented them returning to duty). By March 2009, the Pentagon estimated as many as 360,000 U.S. veterans of the Iraq and Afghanistan conflicts may have suffered traumatic brain injuries (TBI), including 45,000 to 90,000 veterans with persistent symptoms requiring specialized care. In February 2007, one expert from the VA estimated that the number of undiagnosed TBIs were higher than 7,500. According to USA Today, by November 2007 there were more than an estimated 20,000 US troops who had signs of brain injuries without being classified as wounded during combat in Iraq and Afghanistan. A top U.S. Army psychiatrist, Colonel Charles Hoge, said in March 2008 that nearly 30% of troops on their third deployment suffered from serious mental-health problems, and that one year was not enough time between combat tours. A March 12, 2007, Time article reported on a study published in the Archives of Internal Medicine. About one third of the 103,788 veterans returning from the Iraq and Afghanistan wars seen at U.S. Department of Veterans Affairs facilities between September 30, 2001, and September 30, 2005, were diagnosed with mental illness or a psycho-social disorder, such as homelessness and marital problems, including domestic violence. More than half of those diagnosed, 56 percent, were suffering from more than one disorder. The most common combination was post-traumatic stress disorder and depression. In January 2008, the U.S. Army reported that the rate of suicide among soldiers in 2007 was the highest since the Army started counting in 1980. There were 121 suicides in 2007, a 20-percent jump over the prior year. Also, there were around 2100 attempted suicides and self-injuries in 2007. Other sources reveal higher estimates. Data contained in the Army's fifth Mental Health Advisory Team report indicate that, according to an anonymous survey of U.S. troops taken last fall, about 12% of combat troops in Iraq and 17% of those in Afghanistan are taking prescription antidepressants or sleeping pills to help them cope. ... About a third of soldiers in Afghanistan and Iraq say they can't see a mental-health professional when they need to. When the number of troops in Iraq surged by 30,000 last year, the number of Army mental-health workers remained the same – about 200 – making counseling and care even tougher to get. That imbalance between seeing the price of war up close and yet not feeling able to do much about it, the survey suggests, contributes to feelings of "intense fear, helplessness or horror" that plant the seeds of mental distress. "A friend was liquefied in the driver's position on a tank, and I saw everything", was a typical comment. Another: "A huge f______ bomb blew my friend's head off like 50 meters from me." Such indelible scenes – and wondering when and where the next one will happen – are driving thousands of soldiers to take antidepressants, military psychiatrists say. It's not hard to imagine why. Concern has been expressed by mental health professionals about the effects on the emotional health and development of returning veterans' infants and children, due to the increased rates of interpersonal violence, posttraumatic stress, depression, and substance abuse that have been reported among these veterans. Moreover, the stressful effects of physical casualties and loss pose enormous stress for the primary caregiver that can adversely affect her or his parenting, as well as the couple's children directly. The mental health needs of military families in the aftermath of combat exposure and other war-related trauma have been thought likely to be inadequately addressed by the military health system that separates mental health care of the returning soldier from his or her family's care, the latter of whom is generally covered under a contracted, civilian managed-care system. In 2003, 597 insurgents were killed, according to the U.S. military. From January 2004 through December 2009 (not including May 2004 and March 2009), 23,984 insurgents were estimated to have been killed based on reports from Coalition soldiers on the frontlines. 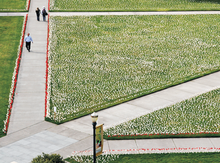 In the two missing months from the estimate, 652 were killed in May 2004, and 45 were killed in March 2009. In 2010, another 676 insurgents were killed. In January and March through October 2011, 451 insurgents were killed. Based on all of these estimates some 26,405 insurgents/militia were killed from 2003, up until late 2011. However, this number could be an overestimate and may include some civilian fatalities, since there have been contradictions between the figures released by the U.S. military and those released by the Iraqi government. For example, the U.S. military's number of insurgents killed in 2005, is 3,247, which is in contrast to the Iraqi government's figure of 1,734. In 2007, 4,544 militants were killed according to the Iraqi ministries, while the U.S. military claimed 6,747 died. Also, in 2008, 2,028 insurgents were reported killed and in 2009, with the exception of the month of June, 488 were killed according to the Iraqi Defence Ministry. These numbers are also not in line with the U.S. military estimate of some 3,984 killed in 2008 and 2009. In addition as of August 22, 2009, approximately 1,719 suicide-bombers had also been reported killed. On September 28, 2006, an Al Qaeda leader claimed that 4,000 foreign insurgents had been killed in the war. On June 6, 2008, an Iraqi Army official revealed that about 6,000 Al Qaeda fighters were among the insurgents killed since the start of the war up until April 2008. Insurgent deaths are hard to estimate. By July 2007, the Department of Labor recorded 933 deaths of contractors in Iraq. By April 2007, the Special Inspector General for Iraq Reconstruction stated that the number of civilian contractor deaths on US-funded projects in Iraq was 916. In January 2007, the Houston Chronicle reported that the Pentagon did not track contractor deaths in Iraq. In January 2017, an estimated 7,761 contractors had been injured in Iraq, but their nationality was not known. By the end 2006, civilian contractors suffered "3,367 injuries serious enough to require four or more days off the job." The Labor Department had these numbers because it tracked workers' compensation claims by injured workers or families of slain contractors under the federal Defense Base Act. By November 2006, there were reports of a significant deterioration of the Iraq health care system as a result of the war. In 2007, a Iraqi Society of Psychiatrists and WHO study found that 70% of 10,000 primary school students in the Sha'ab section of north Baghdad are suffering from trauma-related symptoms. 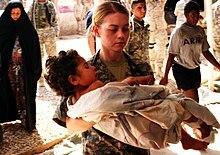 Subsequent articles in The Lancet and Al Jazeera have suggested that the number of cases of birth defects, cancer, miscarriages, illnesses and premature births may have increased dramatically after the first and second Iraq wars, due to the presences of depleted uranium and chemicals introduced during American attacks, especially around Fallujah, Basra and Southern Iraq. Estimates of the total number of Iraqi war-related deaths are highly disputed. According to Keith Krause of the Graduate Institute of International and Development Studies, Geneva, Switzerland, "the consensus seems to be that around 150,000 people died violently as a result of the fighting between 2003 and 2006." In December 2005 President Bush said there were 30,000 Iraqi dead. White House spokesman Scott McClellan later said it was "not an official government estimate", and was based on media reports. The United Nations reported that 34,452 violent civilian deaths occurred in 2006, based on data from morgues, hospitals, and municipal authorities across Iraq. For 2006, a January 2, 2007, Associated Press article reports: "The tabulation by the Iraqi ministries of Health, Defence and Interior, showed that 14,298 civilians, 1,348 police and 627 soldiers had been killed in the violence that raged across the country last year. The Associated Press figure, gleaned from daily news reports from Baghdad, arrived at a total of 13,738 deaths." The Australian reports in a January 2, 2007, article: "A figure of 3700 civilian deaths in October '', the latest tally given by the UN based on data from the Health Ministry and the Baghdad morgue, was branded exaggerated by the Iraqi Government." Iraqi government estimates include "people killed in bombings and shootings but not deaths classed as 'criminal'." Also, they "include no deaths among the many civilians wounded in attacks who may die later from wounds. Nor do they include many people kidnapped whose fate remains unknown." A June 25, 2006, Los Angeles Times article, "War's Iraqi Death Toll Tops 50,000", reported that their estimate of violent deaths consisted "mostly of civilians" but probably also included security forces and insurgents. It added that, "Many more Iraqis are believed to have been killed but not counted because of serious lapses in recording deaths in the chaotic first year after the invasion, when there was no functioning Iraqi government, and continued spotty reporting nationwide since." Here is how the Times got its number: "The Baghdad morgue received 30,204 bodies from 2003 through mid-2006, while the Health Ministry said it had documented 18,933 deaths from 'military clashes' and 'terrorist attacks' from April 5, 2004, to June 1, 2006. Together, the toll reaches 49,137. However, samples obtained from local health departments in other provinces show an undercount that brings the total well beyond 50,000. The figure also does not include deaths outside Baghdad in the first year of the invasion." A study commissioned by the United Nations Development Programme (UNDP), called the Iraq Living Conditions Survey (ILCS), sampled almost 22,000 households across all Iraqi provinces. It estimated 24,000 war-related violent deaths by May 2004 (with a 95 percent confidence interval from 18,000 to 29,000). This study did not attempt to measure what portion of its estimate was made up of civilians or combatants. It would include Iraqi military killed during the invasion, as well as "insurgents" or other fighters thereafter. This study has been criticized for various reasons. For more info see the section in Lancet surveys of Iraq War casualties that compares the Lancet and UNDP ILCS studies. The October 2004 Lancet study done by public health experts from Johns Hopkins University and published on October 29, 2004, in The Lancet medical journal, estimated that 100,000 "excess" Iraqi deaths from all causes had occurred since the U.S. invasion began. The study did not attempt to measure how many of these were civilian, but the study's authors have said they believe that the "vast majority" were non-combatants, based on 7% of the casualties being women and 46% being children under the age of 15 (including Falluja data). To arrive at these excess death figures, a survey was taken from 988 Iraqi households in 33 clusters throughout Iraq, in which the residents were asked how many people lived there and how many births and deaths there had been since the war began. They then compared the death rate with the average from the 15 months before the war. Iraqis were found to be 1.5 times more likely to die from all causes after the invasion (rising from 0.5% to 0.79% per year) than in the 15 months preceding the war, producing an estimate of 98,000 excess deaths. This figure excluded data from one cluster in Falluja, which was deemed too much of an outlier for inclusion in the national estimate. If it included data from Falluja, which showed a higher rate of violent deaths than the other 32 clusters combined, the increased death rate would be raised from 1.5 to 2.5-fold, violent deaths would be 58 times more likely with most of them due to air-strikes by coalition forces, and an additional 200,000 fatalities would be estimated. The Iraqi non-governmental organisation, Iraqiyun, estimated 128,000 deaths from the invasion until July 2005. A July 2005 United Press International (UPI) article said the number came from the chairman of the Iraqiyun humanitarian organization in Baghdad, Dr. Hatim al-'Alwani. He said 55 percent of those killed were women, and children aged 12 and under. The UPI article reported: "Iraqiyun obtained data from relatives and families of the deceased, as well as from Iraqi hospitals in all the country's provinces. The 128,000 figure only includes those whose relatives have been informed of their deaths and does not include those were abducted, assassinated or simply disappeared." A 2010 book by Nicolas Davies reported the Iraqiyun estimate, and that Iraqiyun was affiliated with the political party of Interim President Ghazi Al-Yawer. Davies wrote: "The report specified that it included only confirmed deaths reported to relatives, omitting significant numbers of people who had simply disappeared without trace amid the violence and chaos." The October 2006 Lancet study by Gilbert Burnham (of Johns Hopkins University) and co-authors estimated total excess deaths (civilian and non-civilian) related to the war of 654,965 excess deaths up to July 2006. The 2006 study was based on surveys conducted between May 20 and July 10, 2006. More households were surveyed than during the 2004 study, allowing for a 95% confidence interval of 392,979 to 942,636 excess Iraqi deaths. Those estimates were far higher than other available tallies at the time. The Burnham et al. study has been described as the most controversial study in survey research on armed conflict, and its findings have been widely disputed in the academic literature. Shortly after publication, the study's estimate and methodology came under criticism from a number of sources, including the United States government, academics, and the Iraq Body Count. At the time, other experts, praised the methodology of the study. John Tirman, who commissioned and directed the funding for the study defended the study. A 2008 systematic review of casualty estimates in the Iraq War in the journal Conflict and Health concluded that the highest quality studies have used "population-based methods" that have "yielded the highest estimates. A 2016 study described the Lancet study as seen "widely viewed among peers as the most rigorous investigations of Iraq War–related mortality among Iraqi civilians," and argued that part of the criticism "may have been politically motivated." A number of peer-reviewed studies criticized the Lancet study on the basis of its methodology and exaggerated casualty numbers. The authors of the Lancet study were also accused of ethical breaches in terms of how the survey was conducted and in how the authors responded to requests for data and information. In 2009, the lead author of the Lancet study was censured by American Association for Public Opinion Research (AAPOR) for refusing to provide "several basic facts about" the study. AAPOR had over a 12-year period only formally censured two other individuals. In 2012, Michael Spagat noted that six peer-reviewed studies had identified shortcomings in the Lancet study, and that the Lancet authors had yet to make a substantive response to the critiques. According to Spagat, there is "ample reason" to discard Lancet study estimate. Columbia University statistician Andrew Gelman said in 2014 that "serious flaws have been demonstrated" in the Lancet study, and in 2015 that his impression was that the Lancet study "had pretty much been discredited". Joshua Goldstein, professor emeritus of International Relations at American University, wrote that critics of the study "have argued convincingly that the sample method was biased." According to University of Delaware sociologist Joel Best in his book Stat-Spotting: A Field Guide to Identifying Dubious Data, "it seems likely that [the Lancet estimate] was too large". Conflict scholars Nils Petter Gleditsch, Erik Melander and Henrik Urdal said there were "major biases" in the study, leading to oversampling of households affected by violence. A 2008 study in the Journal of Peace Research found that the 2006 Lancet study may have considerably overestimated Iraq War casualties, that the study made "unusual" methodological choices, and called on the 2006 Lancet study authors to make all of their data available. The 2008 study was awarded "Article of the Year – 2008" by the Journal of Peace Research, with the jury of Lars-Erik Cederman (ETH Zürich), Jon Hovi (University of Oslo) and Sara McLaughlin Mitchell (University of Iowa) writing that the "authors show convincingly that previous studies which are based on a cross-street cluster-sampling algorithm (CSSA) have significantly overestimated the number of casualties in Iraq." American University political scientist Thomas Zeitzoff said the Journal of Peace Research study showed the Lancet study to be "wildly inaccurate" due to its reliance on information from biased samples. Michael Spagat criticized the 2006 Lancet study in a 2010 article for the journal Defence and Peace Economics. Spagat wrote that he found "some evidence relating to data fabrication and falsification" and "this evidence suggests that this survey cannot be considered a reliable or valid contribution towards knowledge about the extent of mortality in Iraq since 2003". Spagat also chided the Lancet study for "ethical violations to the survey's respondents including endangerment, privacy breaches and violations in obtaining informed consent". In a letter to the journal Science, Spagat said that the Lancet study had failed replication in a study by the WHO (the Iraq Family Health Survey). Spagat noted that the lead author of the 2006 study had been censured by the American Association for Public Opinion Research for "repeatedly refusing to disclose the corresponding information for his survey". The Iraq Family Health Survey published by WHO researchers in The New England Journal of Medicine found that the 2006 Lancet study results "considerably overestimated the number of violent deaths" and that the results are highly improbable. In comparing the two studies, peace researcher Kristine Eck of Uppsala University notes that the IFHS study which covered the same period as the Lancet survey "was based on a much larger sample (9,345 households compared to Burnham et al's 1,849) in far more clusters (1,086 clusters compared to Burnham et al's 47)." In comparing the two studies, Joachim Kreutz of Stockholm University and Nicholas Marsh of PRIO said the IFHS study produced "a more reliable estimate." Oxford University political scientist Adam Roberts wrote that the IFHS study was "more rigorous." Burnham, Edward J. Mills, and Frederick M. Burkle noted that the IFHS's data indicated that Iraqi mortality increased by a factor of 1.9 following the invasion, compared to the factor of 2.4 found by Burnham et al., which translates to some 433,000 excess Iraqi deaths (violent and non-violent). Timothy R. Gulden considered it implausible that fewer than one-third of these excess deaths would have been violent in nature. Francisco J. Luquero and Rebecca F. Grais argued that the IFHS's lengthy survey and use of IBC data as a proxy for particularly dangerous areas likely resulted in an underestimate of violent mortality, while Gulden hypothesized that respondents may have been reluctant to report violent deaths to researchers working with the Iraqi government. In a similar vein, Tirman observed that the Iraqi Health Ministry was affiliated with Shi'ite sectarians at the time, remarking that there was evidence that many violent deaths may have been recategorized as "non-violent" to avoid government retribution: "For example, the number of deaths by auto accidents rose by four times the pre-invasion rate; had this single figure been included in the violent deaths category, the overall estimate would have risen to 196,000." Gulden even commented that "the IFHS results are easily in line with the finding of more than 600,000 violent deaths in the study by Burnham et al." However, the authors of the IFHS rejected such claims: "Because the level of underreporting is almost certainly higher for deaths in earlier time periods, we did not attempt to estimate excess deaths. The excess deaths reported by Burnham et al. included only 8.2% of deaths from nonviolent causes, so inclusion of these deaths will not increase the agreement between the estimates from the IFHS and Burnham et al." A graph in the Lancet article purportedly demonstrating that its conclusions are in line with violence trends measured by the IBC and Defense Department used cherry-picked data and had two Y-axes; the authors conceded that the graph was flawed, but the Lancet never retracted it. In early November 2006 Iraq's Health Minister Ali al-Shemari said that he estimated between 100,000 and 150,000 people had been killed since the March 2003 U.S.-led invasion. The Taipei Times reported on his methodology: "Al-Shemari said on Thursday [, November 9, 2006,] that he based his figure on an estimate of 100 bodies per day brought to morgues and hospitals – though such a calculation would come out closer to 130,000 in total." The Washington Post reported: "As al-Shemari issued the startling new estimate, the head of the Baghdad central morgue said Thursday he was receiving as many as 60 violent death victims each day at his facility alone. Dr. Abdul-Razzaq al-Obaidi said those deaths did not include victims of violence whose bodies were taken to the city's many hospital morgues or those who were removed from attack scenes by relatives and quickly buried according to Muslim custom." Each day we lost 100 persons, that means per month 3,000, per year it's 36,000, plus or minus 10 percent", al-Shemari said. "So by three years, 120,000, half-year 20,000, that means 140,000, plus or minus 10 percent", he said, explaining how he came to the figures. "This includes all Iraqis killed – police, ordinary people, children", he said, adding that people who were kidnapped and later found dead were also included in his estimate. He said the figures were compiled by counting bodies brought to "forensic institutes" or hospitals. An official with the ministry also confirmed the figure yesterday [November 10, 2006], but later said that the estimated deaths ranged between 100,000 and 150,000. "The minister was misquoted. He said between 100,000–150,000 people were killed in three-and-a-half years", the official said. From February 25 to March 5, 2007, D3 Systems  conducted a poll for the BBC, ABC News, ARD and USA Today. ABC News reported: "One in six says someone in their own household has been harmed. ... 53 percent of Iraqis say a close friend or immediate family member has been hurt in the current violence. That ranges from three in 10 in the Kurdish provinces to, in Baghdad, nearly eight in 10." The methodology was described thus: "This poll for ABC News, USA Today, the BBC and ARD was conducted February 25 – March 5, 2007, through in-person interviews with a random national sample of 2,212 Iraqi adults, including oversamples in Anbar province, Basra city, Kirkuk and the Sadr City section of Baghdad. The results have a 2.5-point error margin. Field work by D3 Systems of Vienna, Virginia, and KA Research Ltd. of Istanbul." There was a field staff of 150 Iraqis in all. That included 103 interviewers, interviewing selected respondents at 458 locales across the country. "This poll asked about nine kinds of violence (car bombs, snipers or crossfire, kidnappings, fighting among opposing groups or abuse of civilians by various armed forces)." Have you or an immediate family member – by which I mean someone living in this household – been physically harmed by the violence that is occurring in the country at this time? 17% of respondents reported that at least one member of the household had been "physically harmed by the violence that is occurring in the country at this time." The survey did not ask whether multiple household members had been harmed. A September 14, 2007, estimate by Opinion Research Business (ORB), an independent British polling agency, suggests that the total Iraqi violent death toll due to the Iraq War since the U.S.-led invasion is in excess of 1.2 million (1,220,580). Although higher than the 2006 Lancet estimate through June 2006, these results, which were based on a survey of 1,499 adults in Iraq from August 12–19, 2007, are more or less consistent with the figures that were published in the Lancet study. On January 28, 2008, ORB published an update based on additional work carried out in rural areas of Iraq. Some 600 additional interviews were undertaken and as a result of this the death estimate was revised to 1,033,000 with a given range of 946,000 to 1,120,000. How many members of your household, if any, have died as a result of the conflict in Iraq since 2003 (ie as a result of violence rather than a natural death such as old age)? Please note that I mean those who were actually living under your roof. Four or more "more than zero but less than 0.5%"
This ORB estimate has been strongly criticised as exaggerated and ill-founded in peer reviewed literature. The Iraq Family Health Survey published in 2008 in The New England Journal of Medicine surveyed 9,345 households across Iraq and was carried out in 2006 and 2007. It estimated 151,000 deaths due to violence (95% uncertainty range, 104,000 to 223,000) from March 2003 through June 2006. The study was done by the "Iraq Family Health Survey Study Group", a collaborative effort of six organizations: the Federal Ministry of Health, Baghdad; Kurdistan Ministry of Planning, Erbil; Kurdistan Ministry of Health, Erbil; Central Organization for Statistics and Information Technology, Baghdad; World Health Organization Iraq office, Amman, Jordan; World Health Organization, Geneva. In April 2009, the Associated Press reported that Iraq Health Ministry had recorded (via death certificates issued by hospitals and morgues) a total of 87,215 violent deaths of Iraqi citizens between January 1, 2005, and February 28, 2009. The number excludes thousands of missing persons and civilians whose deaths were unrecorded; the government official who provided the data told the AP that if included, the number of dead for that period would be 10 to 20 percent higher. The Associated Press used the Health Ministry tally and other data (including counts of casualties for 2003–2004, and after March 1, 2009, from hospital sources and media reports, in major part the Iraq Body Count) to estimate that more than 110,600 Iraqis were killed from the start of the war to April 2009. Experts interviewed by the AP found this estimate to be credible and an "important baseline" although necessarily an estimate because of unrecorded deaths, especially in inaccessible areas. While mass graves discovered over time shed more light on deaths in the Iraq War, the AP noted that "how many remain will never be known." A 2013 study by Hagopian et al. in PLOS Medicine estimated that 461,000 Iraqis died as a result of the Iraq War. The study used a similar methodology as the 2006 Lancet study and had the lead author of the 2006 study as one of the 12 authors. According to one of the authors, Amy Hagopian, half of the casualties not resulting from violence were due to inadequate treatment of cardiovascular disease. Upon the study's publication, Michael Spagat, a critic of the 2006 Lancet study, said that the 2013 study seemed "to fix most of the methodological flaws of the 2006 paper". Spagat however noted that he found the large confidence interval of the 2013 study disconcerting. Other critics of the 2006 Lancet study mirrored Spagat's views, noting that the 2013 study was an improvement but that the large confidence interval was concerning. A 2017 study by Spagat and Van Weezel replicated the 2013 study by Hagopian et al. and found that the 500,000 casualty estimate by Hagopian et al. was not supported by data. Spagat and Van Weezel said that Hagopian et al. made many methodological errors. Hagopian et al. defended their original study, arguing that Van Weezel and Spagat misunderstood their method. Van Weezel and Spagat answered, saying that the response by Hagopian et al. "avoids the central points, addresses only secondary issues and makes ad hominem attacks." Some studies estimating the casualties due to the war in Iraq say there are various reasons why the estimates and counts may be low. Morgue workers have alleged that official numbers underestimate the death toll. The bodies of some casualties do not end up in morgue and thus may go unrecorded. In 2006, The Washington Post reported: "Police and hospitals often give widely conflicting figures of those killed in major bombings. In addition, death figures are reported through multiple channels by government agencies that function with varying efficiency." ... sometimes it was problematic or too dangerous to enter a cluster of households, which might well result in an undercount; data from the Iraq Body Count on the distribution of deaths among provinces were used to calculate estimates in these instances. If the clustering of violent deaths wasn't accurately captured, that could also increase uncertainty. The sampling frame was based on a 2004 count, but the population has been changing rapidly and dramatically because of sectarian violence, the flight of refugees, and overall population migration. Another source of bias in household surveys is underreporting due to the dissolution of some households after a death, so that no one remains to tell the former inhabitants' story. research has shown that household surveys typically miss 30 to 50 percent of deaths. One reason is that some families that have suffered violent deaths leave the survey area. ... Some people are kidnapped and disappear, and others turn up months or years later in mass graves. Some are buried or otherwise disposed of without being recorded. In particularly violent areas, local governments have effectively ceased to function, and there are ineffective channels for collecting and passing information between hospitals, morgues and the central government. Aside from Bosnia, we can find no conflict situation where passive surveillance [used by the IBC] recorded more than 20% of the deaths measured by population-based methods [used in the Lancet studies]. In several outbreaks, disease and death recorded by facility-based methods underestimated events by a factor of ten or more when compared with population-based estimates. Between 1960 and 1990, newspaper accounts of political deaths in Guatemala correctly reported over 50% of deaths in years of low violence but less than 5% in years of highest violence. The report describes no other specific examples except for this study of Guatemala. Juan Cole wrote in October 2006 that even though heavy fighting could be observed, none of the Iraqi casualties in the skirmishes were reported on, which suggests undercounting. A July 28, 2004, opinion piece by Robert Fisk published by The Independent reports that "some families bury their dead without notifying the authorities." Of course, in conditions of active rebellion, the safer areas accessible to Western reporters are likely to be those under US/Coalition control, where deaths are, in turn, likely to be due to insurgent attacks. Areas of insurgent control, which are likely to be subject to US and Iraqi government attack, for example most of Anbar province, are simply off-limits to these reporters. Thus, the realities of reporting imply that reporters will be witness to a larger fraction of deaths due to insurgents and a lesser proportion of deaths due to US and Iraqi government forces. The deaths reported by officials and published in the news media represent only a fraction of the thousands of mutilated bodies winding up in Baghdad's overcrowded morgue each month. ... Bodies are increasingly being dumped in and around Baghdad in fields staked out by individual Shiite militias and Sunni insurgent groups. Iraqi security forces often refuse to go to the dumping grounds, leaving the precise number of bodies in those sites unknown. Civilian deaths, unlike those of American troops, often go unrecorded. The Australian reported in January 2007 that Iraqi government casualty estimates do not count deaths classed as 'criminal', deaths of civilians who get wounded and die later from the wounds, or kidnap victims who have not been found. The Iraq Body Count project (IBC) stated in November 2004 that "we have always been quite explicit that our own total is certain to be an underestimate of the true position, because of gaps in reporting or recording". A week before she was killed by a suicide bomber, humanitarian worker Marla Ruzicka forced military commanders to admit they did keep records of Iraqi civilians killed by US forces. ... in an essay Ms Ruzicka wrote a week before her death on Saturday and published yesterday, the 28-year-old revealed that a Brigadier General told her it was "standard operating procedure" for US troops to file a report when they shoot a non-combatant. She obtained figures for the number of civilians killed in Baghdad between February 28 and April 5 , and discovered that 29 had been killed in firefights involving US forces and insurgents. This was four times the number of Iraqi police killed. The finding confirmed a September 8 McClatchy Newspapers report that U.S. officials excluded scores of people killed in car bombings and mortar attacks from tabulations measuring the results of a drive to reduce violence in Baghdad. By excluding that data, U.S. officials were able to boast that deaths from sectarian violence in the Iraqi capital had declined by more than 52 percent between July and August, McClatchy newspapers reported. A murder of an Iraqi is not necessarily counted as an attack. If we cannot determine the source of a sectarian attack, that assault does not make it into the database. A roadside bomb or a rocket or mortar attack that doesn't hurt U.S. personnel doesn't count. In May 2004, Associated Press completed a survey of the morgues in Baghdad and surrounding provinces. The survey tallied violent deaths from May 1, 2003, when President Bush declared an end to major combat operations, through April 30, 2004. In Baghdad, a city of about 5.6 million, 4,279 people were recorded killed in the 12 months through April 30, , according to figures provided by Kais Hassan, director of statistics at Baghdad's Medicolegal Institute, which administers the city's morgues. "Before the war, there was a strong government, strong security. There were a lot of police on the streets and there were no illegal weapons", he said during an AP reporter's visit to the morgue. "Now there are few controls. There is crime, revenge killings, so much violence." The figure does not include most people killed in big terrorist bombings, Hassan said. The cause of death in such cases is obvious so bodies are usually not taken to the morgue, but given directly to victims' families. Also, the bodies of killed fighters from groups like the al-Mahdi Army are rarely taken to morgues. Accidental trauma deaths from car accidents, falls, etc. are not included in the numbers. The article reports that the numbers translate to 76 killings per 100,000 people in Baghdad, compared to 39 in Bogotá, Colombia, 7.5 in New York City, and 2.4 in neighboring Jordan. The article states that there were 3.0 killings per 100,000 people in Baghdad in 2002 (the year before the war). Morgues surveyed in other parts of Iraq also reported large increases in the number of homicides. Karbala, south of Baghdad, increased from an average of one homicide per month in 2002 to an average of 55 per month in the year following the invasion; in Tikrit, north of Baghdad, where there were no homicides in 2002, the rate had grown to an average of 17 per month; in the northern province of Kirkuk, the rate had increased from 3 per month in 2002 to 34 per month in the survey period. ^ a b c Hagopian, Amy; Flaxman, Abraham D.; Takaro, Tim K.; Esa Al Shatari, Sahar A.; Rajaratnam, Julie; Becker, Stan; Levin-Rector, Alison; Galway, Lindsay; Hadi Al-Yasseri, Berq J.; Weiss, William M.; Murray, Christopher J.; Burnham, Gilbert; Mills, Edward J. (October 15, 2013). "Mortality in Iraq Associated with the 2003–2011 War and Occupation: Findings from a National Cluster Sample Survey by the University Collaborative Iraq Mortality Study". PLoS Medicine. 10 (10): e1001533. doi:10.1371/journal.pmed.1001533. PMC 3797136. PMID 24143140. ^ a b c d e Associated Press via NBC News. April 24, 2009. Report: 110,600 Iraqis killed since invasion. Full AP article. ^ a b c d e Associated Press via Boston Herald. April 23, 2009. "AP Impact: Secret Tally Has 87,215 Iraqis Dead" Archived October 18, 2011, at the Wayback Machine. ^ a b c d e Iraq Body Count database. From the Iraq Body Count project. The database page says: "Gaps in recording and reporting suggest that even our highest totals to date may be missing many civilian deaths from violence." ^ a b c d Staff writer (October 23, 2010). "Iraq War Logs: What the Numbers Reveal" Archived January 5, 2016, at the Wayback Machine. Iraq Body Count. ^ a b Rogers, Simon (October 23, 2010). "Wikileaks Iraq: Data Journalism Maps Every Death – Data Journalism Allows Us To Really Interrogate the Wikileaks Iraq War Logs Release. Here Is the Statistical Breakdown – and Data for You To Download" Archived January 7, 2011, at the Wayback Machine. Data Blog – Facts Are Sacred (blog on The Guardian). Retrieved November 20, 2010. ^ a b "Iraq: The War Logs" Archived December 8, 2016, at the Wayback Machine. The Guardian. ^ a b Carlstrom, Gregg (October 22, 2010; last modified October 24, 2010 (at November 21, 2010)). "WikiLeaks Releases Secret Iraq File – Al Jazeera Accesses 400,000 Secret US Military Documents, Which Reveal the Inside Story of the Iraq War" Archived October 23, 2010, at the Wayback Machine. Al Jazeera. Retrieved November 21, 2010. ^ "The WikiLeaks Iraq War Logs: Greatest Data Leak in US Military History". Der Spiegel. October 22, 2010. Retrieved October 23, 2010. ^ a b Leigh, David (October 22, 2010). "Iraq War Logs Reveal 15,000 Previously Unlisted Civilian Deaths – Leaked Pentagon Files Contain Records of More than 100,000 Fatalities Including 66,000 Civilians" Archived July 30, 2013, at the Wayback Machine. The Guardian. Retrieved November 20, 2010. ^ a b Editors – Katz, Jeffrey; Doug Roberts, Doug; Sutherland, J.J. (undated). "The Toll of War – U.S. Troop Fatalities in Iraq since March 2003 – A Month-by-Month Count of U.S. Troops Killed in the Conflict" Archived May 11, 2018, at the Wayback Machine (bar chart of various death toll estimates). NPR. Retrieved November 21, 2010. ^ a b Staff writer (October 24, 2010). "Secret Iraq Files – US Turned Blind Eye To Torture" Archived November 9, 2011, at the Wayback Machine. Al Jazeera. Retrieved November 21, 2010. ^ Staff writer (undated). "Iraq War Logs – Related Articles, Background Features and Opinions about this Topic" Archived February 1, 2016, at the Wayback Machine (gateway/portal page of site). Der Spiegel. Retrieved November 21, 2010. ^ Staff writer (October 22, 2010). "WikiLeaks Iraq FAQs – What the Logs Really Say" Archived October 26, 2010, at the Wayback Machine. Der Spiegel. Retrieved November 21, 2010. ^ a b c Iraq Body Count project Archived November 9, 2009, at WebCite. Source of IBC quote on undercounting by media is here. ^ [dead link]"WHO Country Office in Iraq. Iraq Family Health Survey" Archived June 11, 2008, at the Wayback Machine. World Health Organization (WHO). ^ Press release (January 9, 2008). "New Study Estimates 151,000 Violent Iraqi Deaths Since 2003 Invasion" Archived December 13, 2013, at the Wayback Machine.World Health Organization (WHO). Retrieved September 2, 2010. ^ Alkhuzai AH, Ahmad IJ, Hweel MJ, Ismail TW, et al. (2008). "Violence-Related Mortality in Iraq from 2002 to 2006". The New England Journal of Medicine. 358 (2): 484–93. doi:10.1056/NEJMsa0707782. PMID 18184950. Archived from the original on April 21, 2018. Retrieved April 20, 2018. ^ Staff writer (January 10, 2008). "New Study Says 151,000 Iraqi Dead – One of the Biggest Surveys So Far of Iraqis Who Have Died Violently Since the US-Led Invasion of 2003 Has Put the Figure at About 151,000". BBC News. Archived from the original on February 8, 2010. Retrieved September 2, 2010. ^ Boseley, Sarah (January 10, 2008). "151,000 Civilians Killed Since Iraq Invasion – Figures Up to June 2006 from Household Survey – Government Accepts New estimate on Death Toll. The Guardian. Retrieved September 2, 2010. ^ a b Brown, Davia; Partlow, Joshua (January 10, 2008). "New Estimate of Violent Deaths Among Iraqis Is Lower" Archived November 10, 2016, at the Wayback Machine. The Washington Post. Retrieved September 2, 2010. ^ a b "Update on Iraqi Casualty Data" Archived February 1, 2008, at the Wayback Machine by Opinion Research Business. January 2008. ^ a b Susman, Tina (September 14, 2007). "Poll: Civilian Death Toll in Iraq May Top 1 Million" Archived May 31, 2014, at the Wayback Machine. Los Angeles Times (via commondreams.org). Retrieved September 2, 2010. ^ a b Beaumont, Peter; Walters, Joanna (September 16, 2007). "Greenspan Admits Iraq Was About Oil, As Deaths Put at 1.2 Million" Archived December 13, 2013, at the Wayback Machine. The Observer (via commondreams.org). Retrieved September 2, 2010. ^ a b c Staff writer (September 18, 2007). "The Media Ignore Credible Poll Revealing 1.2 Million Violent Deaths in Iraq" Archived November 30, 2012, at the Wayback Machine. Media Lens. Retrieved September 2, 2010. ^ a b (registration required) Tavernise, Sabrina (January 17, 2007). "Iraqi Death Toll Exceeded 34,000 in '06, U.N. Says" Archived November 7, 2016, at the Wayback Machine. The New York Times. ^ a b c Supplement to 2006 Lancet study: "The Human Cost of the War in Iraq: A Mortality Study, 2002–2006" (PDF). (603 KB). By Gilbert Burnham, Shannon Doosy, Elizabeth Dzeng, Riyadh Lafta, and Les Roberts. ^ a b c d [dead link]"Iraqi Health Minister Estimates as Many as 150,000 Iraqis Killed by Insurgents" Archived September 18, 2008, at the Wayback Machine. International Herald Tribune. November 9, 2006. ^ a b c d Staff writer (November 11, 2006). "Iraqi Death Toll Estimates Go as High as 150,000" Archived March 3, 2016, at the Wayback Machine. Agence France-Presse/Associated Press (via Taipei Times). Retrieved September 6, 2010. ^ Costs of War. (costsofwar.org). Watson Institute for International and Public Affairs at Brown University. See "About" page. ^ Human Cost of the Post-9/11 Wars: Lethality and the Need for Transparency. November 2018. By Neta C. Crawford, a project director at Costs of War Project. Watson Institute for International and Public Affairs at Brown University. ^ Half Million Killed by America's Global War on Terror 'Just Scratches the Surface' of Human Destruction. Nov 9, 2018. By Jessica Corbett, staff writer, Common Dreams. ^ The wars in Iraq and Afghanistan have killed at least 500,000 people, according to a new report that breaks down the toll. Nov 9, 2018. By Daniel Brown, Business Insider. ^ iCasualties: Iraq Coalition Casualty Count – Journalists Killed Archived August 11, 2009, at the Wayback Machine. ^ Committee to Protect Journalists (CPJ). IRAQ: Journalists in Danger Archived July 17, 2012, at the Wayback Machine. ^ Committee to Protect Journalists (CPJ). Media Workers Killed in Iraq Since March 2003 Archived September 3, 2012, at the Wayback Machine. ^ [dead link] Ryan, Missy (November 21, 2007). "War-Weary Aid Groups Weigh Risk, Need in Iraq" Archived March 31, 2008, at the Wayback Machine. Reuters. ^ NGOs Coordination Committee in Iraq Archived April 9, 2015, at the Wayback Machine. ^ John Pike. "globalsecurity.org". Retrieved October 27, 2014. ^ a b c iCasualties.org (was lunaville.org). Benicia, California. Patricia Kneisler, et al.., "Iraq Coalition Casualty Count" Archived February 6, 2016, at the Wayback Machine. ^ a b "Forces: U.S. & Coalition Casualties" Archived June 10, 2009, at the Wayback Machine. CNN, From March 2003 onwards. ^ "latest injury, disease, and other-medical totals" (PDF). Archived from the original (PDF) on June 2, 2011. ^ a b c "Global War on Terrorism – Operation Iraqi Freedom, By Month" Archived June 2, 2011, at the Wayback Machine. United States Department of Defense. "Prepared by: Defense Manpower Data Center. Statistical Information Analysis Division." ^ Iraq Coalition Casualties: Military Fatalities Archived March 26, 2010, at the Wayback Machine. ^ iCasualties OIF: Fatalities By Country Archived April 18, 2009, at the Wayback Machine. ^ a b Debusmann, Bernd (July 3, 2007). "In Outsourced U.S. Wars, Contractor Deaths Top 1,000" Archived February 20, 2009, at the Wayback Machine. Reuters. Retrieved September 2, 2010. 10,569 wounded and 933 deaths in Iraq. 224 are U.S. citizens. ^ a b iCasualties OIF: Contractor Deaths Archived March 20, 2014, at the Wayback Machine. Incomplete list. ^ a b "Reconstruction Report: 916 Death Claims for Civilian Contractors in Iraq". USA Today. April 30, 2007. ^ "Special Inspector General for Iraq Reconstruction: April 2007 Report" Archived February 24, 2010, at the Wayback Machine. ^ Broder, John M.; Risen, James (May 19, 2007). "Death Toll for Contractors Reaches New High in Iraq" Archived November 7, 2016, at the Wayback Machine. The New York Times. Retrieved September 2, 2010. "workers from more than three dozen other countries". ^ Roberts, Michelle (February 24, 2007). "Contractor Deaths Add Up in Iraq" Archived June 13, 2008, at the Wayback Machine. Associated Press (via the Deseret Morning News). Retrieved September 2, 2010. "... often highly dangerous duties almost identical to those performed by many U.S. troops." ^ Miller, T. Christian (July 4, 2007). "Private Contractors Outnumber U.S. Troops in Iraq" Archived July 7, 2013, at the Wayback Machine. Los Angeles Times. Retrieved September 2, 2010. 182,000 contractors: "21,000 Americans, 43,000 foreign contractors and about 118,000 Iraqis". ^ Staff writer (January 17, 2007). "Chronology – The Deadliest Bomb Attacks in Iraq" Archived March 21, 2009, at the Wayback Machine. Reuters (via AlertNet). Retrieved September 2, 2010. ^ [dead link] Hurst, Steven R.; Frayer, Lauren. "4 Bombings in Baghdad Kill at Least 183" Archived April 20, 2007, at the Wayback Machine. Associated Press (via 'Yahoo! News). ^ a b Weisskopf, Michael (January 18, 2007). "A Grim Milestone: 500 Amputees" Archived January 21, 2007, at the Wayback Machine. Time. Retrieved September 2, 2010. ^ Zimmerman, Eilene (November 8, 2006). "Getting Amputees Back on Their Feet – Navy's One-Stop, State-of-the-Art Rehabilitation Center in California Helps War Injured Realize Goals" Archived November 15, 2007, at the Wayback Machine. San Francisco Chronicle. Retrieved September 2, 2010. ^ Brain trauma a 'silent epidemic' among Iraq veterans Archived January 17, 2013, at the Wayback Machine. By Moni Basu. November 19, 2006. The Atlanta Journal-Constitution. ^ Zoroya, Gregg (October 18, 2005). "1 in 4 Iraq Vets Ailing on Return" Archived September 21, 2012, at the Wayback Machine. USA Today. Retrieved September 2, 2010. ^ [dead link] Higgins, Alexander G. (November 3, 2006). "U.N.: 100,000 Iraq Refugees Flee Monthly" Archived September 4, 2007, at the Wayback Machine. Boston Globe. ^ [dead link]"Secretary of Defense Interview with Bob Woodward – 23 Oct, 2003" Archived July 30, 2006, at the Wayback Machine. United States Department of Defense: News Transcript. April 19, 2004. ^ Steele, Jonathan (May 28, 2003). "Body Counts – The Western Media Focused on the Number of Civilians Killed in Afghan War, But the Country's Ill-Prepared Armed Forces Suffered Far Greater Losses". The Guardian. Retrieved September 2, 2010. ^ Press release (October 28, 2003). "New Study Finds: 11,000 to 15,000 Killed in Iraq War; 30 Percent are Non-Combatants; Death Toll Hurts Postwar Stability Efforts, Damages US Image Abroad" Archived October 17, 2006, at the Wayback Machine. Project on Defense Alternatives (via Common Dreams NewsCenter). Retrieved September 2, 2010. ^ Conetta, Carl (October 23, 2003). "The Wages of War: Iraqi Combatant and Noncombatant Fatalities in the 2003 Conflict – Project on Defense Alternative Research Monograph #8" Archived August 31, 2009, at the Wayback Machine. Project on Defense Alternatives (via Commonwealth Institute). Retrieved September 2, 2010. ^ a b c "A Dossier of Civilian Casualties 2003–2005" (PDF). (650 KB). Iraq Body Count project. Report covers from March 20, 2003, to March 19, 2005, based on data available by June 14, 2005. ^ Staff writer (April 28, 2006). "Iraq Body Count – Media Lens Responds" Archived March 5, 2016, at the Wayback Machine. Newsnight. Retrieved September 3, 2010. ^ Fuller, David. (April 28, 2006) "Virtual War Follows Iraq Conflict" Archived March 5, 2016, at the Wayback Machine. BBC News (via Newsnight). Retrieved September 2, 2010. ^ "Speculation is no substitute: a defence of Iraq Body Count"
^ "Year Four: Simply the Worst" Archived January 5, 2016, at the Wayback Machine. Press Release 15, Iraq Body Count. ^ "Methods". Iraq Body Count. Retrieved October 22, 2011. ^ a b Hagopian, Amy (2018). "How to estimate (and not to estimate) war deaths: A reply to van Weezel and Spagat". Research & Politics. 5: 205316801775390. doi:10.1177/2053168017753901. ^ Siegler, Anne; Roberts, Leslie; Balch, Erin; Bargues, Emmanuel; Bhalla, Asheesh; Bills, Corey; Dzeng, Elizabeth; Epelboym, Yan; Foster, Tory (July 2008). "Media coverage of violent deaths in iraQ: an opportunistic capture-recapture assessment". Prehospital and Disaster Medicine. 23 (4): 369–371. doi:10.1017/s1049023x00006026. ISSN 1049-023X. PMID 18935953. ^ Carpenter, Dustin; Fuller, Tova; Roberts, Les (June 2013). "WikiLeaks and Iraq Body Count: the sum of parts may not add up to the whole-a comparison of two tallies of Iraqi civilian deaths". Prehospital and Disaster Medicine. 28 (3): 223–229. doi:10.1017/S1049023X13000113. ISSN 1049-023X. PMID 23388622. ^ Burckle, Frederick (2013). "Civilian mortality after the 2003 invasion of Iraq". Lancet. 381 (9870): 877–879. doi:10.1016/S0140-6736(12)62196-5. PMID 23499026. Archived from the original on November 21, 2015. Retrieved February 8, 2018. ^ [dead link] Janabi, Ahmed (July 31, 2004). "Iraqi Group: Civilian Toll over 37,000". Al Jazeera. Archived from the original on September 11, 2005. ^ Lochhead, Carolyn (January 16, 2007). "Conflict in Iraq – Iraq Refugee Crisis Exploding – 40% of Middle Class Believed To Have Fled Crumbling Nation" Archived May 14, 2012, at the Wayback Machine. San Francisco Chronicle. Retrieved September 3, 2010. ^ Knickerbocker, Brad (August 29, 2006). "In Iraq, Fewer Killed, More Are Wounded – New Data Show Better Technology and Tactics Are Keeping Fatalities Down, But Injuries Remain High" Archived March 9, 2007, at the Wayback Machine. The Christian Science Monitor. Retrieved September 3, 2010. ^ Hastings, Deborah (August 12, 2006). "Is An Armament Sickening U.S. Soldiers?". Associated Press (via Common Dreams NewsCenter. Archived from the original on July 3, 2014. Retrieved September 3, 2010. ^ (registration required) Hoge, M.D., Charles W.; Castro, PhD, Carl A.; Messer, PhD, Stephen C.; McGurk, PhD, Dennis; Cotting, PhD, Dave I.; and Koffman, M.D., M.P.H., Robert L. (July 1, 2004). "Combat Duty in Iraq and Afghanistan, Mental Health Problems, and Barriers to Care" Archived January 21, 2005, at the Wayback Machine. The New England Journal of Medicine. ^ "House of Commons Hansard Written Answers for 4 October 2004". The United Kingdom Parliament. Archived from the original on September 18, 2012. Retrieved September 3, 2010. ^ Korzeniewski, K; Olszański, R (2004). "Leishmaniasis among soldiers of stabilization forces in Iraq. Review article". Int Marit Health. 55 (1–4): 155–63. PMID 15881551. ^ Staff writer (July 25, 2008). "Pentagon: 16 Soldiers Died from Electric Shock". Associated Press (via USA Today. Archived from the original on May 30, 2009. Retrieved September 3, 2010. ^ (registration required) Risen, James (May 4, 2008). "Despite Alert, Flawed Wiring Still Kills G.I.'s". The New York Times. Archived from the original on August 11, 2014. Retrieved April 1, 2010. ^ "'Nightline' Sparks Controversy". Archived from the original on May 13, 2018. Retrieved May 13, 2018. ^ "PM – Controversy over reportage of dead US soldiers". Australian Broadcasting Corporation. Archived from the original on May 12, 2017. Retrieved May 13, 2018. ^ "Nightline Anchor Ted Koppel to Leave Abc News in December". PBS NewsHour. March 31, 2005. Archived from the original on May 13, 2018. Retrieved May 13, 2018. ^ Zoroya, Gregg (March 4, 2009). "360,000 Veterans May Have Brain Injuries" Archived September 11, 2012, at the Wayback Machine. USA Today. Retrieved September 3, 2010. ^ Mason, Michael (February 23, 2007). "Dead Men Walking – What Sort of Future Do Brain-Injured Iraq Veterans Face?" Archived December 14, 2010, at the Wayback Machine. Discover. Retrieved November 21, 2010. ^ Zoroya, Gregg (November 22, 2007). "20,000 Vets' Brain Injuries Not Listed in Pentagon Tally" Archived January 7, 2012, at the Wayback Machine. USA Today. Retrieved September 3, 2010. ^ a b c Thompson, Mark (June 5, 2008). "America's Medicated Army" Archived January 14, 2009, at the Wayback Machine. Time. Retrieved September 3, 2010. ^ Wallis, Claudia (March 12, 2007). "Casualty of War: Mental Health" Archived March 15, 2007, at the Wayback Machine. Time. Retrieved September 3, 2010. ^ Staff writer (January 31, 2008). "Army Report Reveals 121 Suspected Suicides Among Soldiers in 2007, 20 Percent Increase Over 2006" Archived February 3, 2008, at the Wayback Machine. Associated Press (via Fox News). Retrieved September 3, 2010. ^ 18 veterans commit suicide each day. April 26, 2010. Army Times. ^ a b Schechter, D.S. ; Davis, B.E. (2007). "Parenting in Times of Crisis". Pediatric Annals. 36 (4): 216–222. doi:10.3928/0090-4481-20070401-11. ^ Sayers, S.L. ; Farrow, V.A. ; Ross, J.; Oslin, D.W. (2009). "Family Problems Among Recently Returned Military Veterans Referred for a Mental Health Evaluation". Journal of Clinical Psychiatry. 70 (2): 163–170. doi:10.4088/jcp.07m03863. ^ McFarlane, A.C. (2009). "Military Deployment: The Impact on Children and Family Adjustment and the Need for Care". Current Opinion in Psychiatry. 22 (4): 369–373. doi:10.1097/yco.0b013e32832c9064. PMID 19424067. ^ Michaels, Jim (September 27, 2007). "19,000 Insurgents Killed in Iraq Since '03". USA Today. Archived from the original on April 28, 2011. Retrieved September 3, 2010. ^ Leigh, David (October 22, 2010). "Iraq war logs reveal 15,000 previously unlisted civilian deaths". The Guardian. London. ^ "March violence claims 252 Iraqi lives | ReliefWeb". Reliefweb.int. April 1, 2009. Retrieved October 22, 2011. ^ Viola Gienger (December 30, 2010). "Iraq Civilian Deaths Drop for Third Year as Toll Eases After U.S. Drawdown". Bloomberg. Retrieved October 27, 2014. ^ "Jan Iraq death toll highest in four months". The Age. February 2011. Retrieved October 27, 2014. ^ "Two U.S. troops killed in Iraq". United Press International. Retrieved October 27, 2014. ^ "Iraq monthly death toll falls in April". Retrieved October 27, 2014. ^ "Iraq death toll in May lowest in 2011". March 22, 2018. Retrieved October 27, 2014. ^ "Homepage – Daily News Egypt". Archived from the original on January 11, 2012. ^ "Iraq death toll for July second highest in 2011". MSN. Archived from the original on December 8, 2011. Retrieved October 27, 2014. ^ Staff writer (January 4, 2006). "Nearly 6,000 Killed in Iraq Violence in 2005" Archived October 18, 2012, at the Wayback Machine. People's Daily. Retrieved September 3, 2010. ^ "Civilian casualties drop dramatically in Iraq". Reuters. Reuters. December 31, 2007. Retrieved October 27, 2014. ^ Staff writer (January 1, 2009). "Iraq Hails Lowest Monthly Death Toll in Nearly Three Years – Government Figures Reveal 6,226 Iraqis Killed in Iraq in 2008, Down from 6,772 in 2007" Archived June 12, 2011, at the Wayback Machine. Middle East Online. Retrieved September 3, 2010. ^ "Rantburg article". Retrieved October 27, 2014. ^ a b Calderwood, James (April 2, 2007). "Suicide Bombings in Iraq on the Rise". Associated Press (via Fox News). Archived from the original on October 26, 2012. Retrieved September 3, 2010. ^ Jervis, Rick (May 9, 2006). "Car Bombings Down in Iraq, Military Says". USA Today. Archived from the original on August 12, 2007. Retrieved September 3, 2010. ^ a b Jervis, Rick (January 22, 2006). "Attacks in Iraq Jumped in 2005". USA Today. Archived from the original on May 15, 2011. Retrieved September 3, 2010. ^ [dead link] "Al Qaeda Leader: Over 4,000 Foreign Insurgents Killed in Iraq" Archived November 11, 2006, at the Wayback Machine. Associated Press (via WFAN). September 28, 2006. ^ (subscription required) Staff writer (June 6, 2008). "Six Thousand Al Qaida Fighters Killed in Iraq Says Top Official" Archived June 7, 2008, at the Wayback Machine. iraqupdates.com. Retrieved September 3, 2010. ^ Staff writer (July 26, 2005). "50,000 Iraqi Insurgents Dead, Caught" Archived December 1, 2006, at the Wayback Machine. The Washington Times. Retrieved September 3, 2010. ^ Staff writer (September 8, 2004). "Civilian, Insurgent Deaths Hard To Tally – Neither U.S. Nor Iraq Regime Keeps Count" Archived August 16, 2010, at the Wayback Machine. Scripps Howard News Service (via Seattle Post-Intelligencer). Retrieved September 3, 2010. ^ "In outsourced U.S. wars, contractor deaths top 1,000". Reuters. 2007. Archived from the original on February 10, 2018. Retrieved February 9, 2018. ^ a b c Ivanovich, David; Clanton, Brett (January 28, 2007). "Contractor Deaths in Iraq Nearing 800 – Toll Has Surged in Past Months, But Civilians Still Line Up for the Jobs" Archived February 15, 2010, at the Wayback Machine. Houston Chronicle. Retrieved September 2, 2010. ^ [dead link] Roberts, Michelle (February 23, 2007). "Iraq Contractor Deaths Go Little Noticed". The Guardian. ^ Roug, Louise (November 11, 2006). "Decrepit Healthcare Adds to Toll in Iraq" Archived November 4, 2012, at the Wayback Machine. Los Angeles Times. ^ Palmer, James (March 19, 2007). "Protestors Plead for Peace – Civilian Toll: Iraqis Exhibit More Mental Health Problems" Archived November 15, 2007, at the Wayback Machine. San Francisco Chronicle. Retrieved September 2, 2010. ^ Burkle, Frederick; Garfield, Richard (March 16, 2013). "Civilian mortality after the 2003 invasion of Iraq". The Lancet. 381 (9870): 877–879. doi:10.1016/S0140-6736(12)62196-5. PMID 23499026. Retrieved November 29, 2018. ^ Jamail, Dahr (March 16, 2013). "Iraq's wars, a legacy of cancer". Al Jazeera. Retrieved November 29, 2018. ^ Krause, Keith (April 1, 2017). "Bodies count: the politics and practices of war and violent death data". Human Remains and Violence: An Interdisciplinary Journal. 3 (1): 90–115. doi:10.7227/HRV.3.1.7. ISSN 2054-2240. ^ George W. Bush, "President Discusses War on Terror and Upcoming Iraqi Elections" Archived September 19, 2017, at the Wayback Machine. White House transcript. December 12, 2005. Says 30,000 Iraqi dead. ^ Staff writer (December 12, 2005). "Bush: Iraqi Democracy Making Progress – President Compares Iraq's Struggle to America's Founding" Archived December 1, 2007, at the Wayback Machine. CNN. Retrieved September 3, 2010. "I would say 30,000, more or less, have died as a result of the initial incursion and the ongoing violence against Iraqis", Bush said. CNN writes: "White House spokesman Scott McClellan later said Bush was basing his statement on media reports, 'not an official government estimate.'" ^ Staff writer (January 3, 2007). "Bruised and Battered: Iraqi Toll Crosses 16000 in ’06" Archived January 4, 2007, at the Wayback Machine. Associated Press (via The Indian Express). Retrieved September 3, 2010. ^ a b c [dead link] Macdonald, Alastair (January 2, 2007). "Iraq Civilian Deaths Hit New Record" Archived November 15, 2007, at the Wayback Machine. The Australian. ^ Roug, Louise; Smith, Doug (June 25, 2006). "War's Iraqi Death Toll Tops 50,000 – Higher Than the U.S. Estimate But Thought To Be Undercounted, the Tally Is Equivalent to 570,000 Americans Killed in Three Years" Archived March 17, 2010, at the Wayback Machine. Los Angeles Times (via Common Dreams NewsCenter). Retrieved September 3, 2010. ^ "Iraq Living Conditions Survey 2004". United Nations Development Programme. Archived from the original on May 29, 2006. ^ Roberts, Les; Lafta, Riyadh; Garfield, Richard; Khudhairi, Jamal; Burnham, Gilbert (October 29, 2004). "Mortality after the 2003 invasion of Iraq: a cross-sectional cluster sample survey". The Lancet. 368 (9545): 1421–8. CiteSeerX 10.1.1.88.4036. doi:10.1016/s0140-6736(06)69491-9. PMID 17055943. ^ "Study Puts Iraqi Toll at 100,000". CNN. October 29, 2004. Archived from the original on June 15, 2006. ^ Iraqi civilian casualties Archived November 3, 2011, at the Wayback Machine. United Press International. July 12, 2005. Archived here "Archived copy". Archived from the original on August 21, 2008. Retrieved December 18, 2010. CS1 maint: Archived copy as title (link) too. ^ Blood on Our Hands: The American Invasion and Destruction of Iraq. Book by Nicolas J.S. Davies. Published June 2010. ISBN 1-934840-98-X, ISBN 978-1-934840-98-6. Iraqiyun info is from page 139. ^ "Unreported Iraqi war deaths revealed by Wikileaks are only the tip of an iceberg." Archived December 28, 2010, at the Wayback Machine By Nicolas Davies. October 24, 2010. Article is here  Archived December 14, 2010, at the Wayback Machine, too. ^ Kahl, Colin H. (2007). "In the Crossfire or the Crosshairs? Norms, Civilian Casualties, and U.S. Conduct in Iraq". International Security. 32 (1): 7–46. doi:10.1162/isec.2007.32.1.7. ISSN 0162-2889. ^ a b Kristine Eck, "Survey Research in Conflict and Post-conflict Societies" in Understanding Peace Research: Methods and Challenges (eds. Kristine Hoglund & Magnus Oberg), Routledge: 2011, p. 171. ^ a b c Montclos, Marc-Antoine Pérouse de (2016). "Numbers Count: Dead Bodies, Statistics, and the Politics of Armed Conflicts". Violence, Statistics, and the Politics of Accounting for the Dead. Demographic Transformation and Socio-Economic Development. Springer, Cham. pp. 47–69. doi:10.1007/978-3-319-12036-2_3. ISBN 978-3-319-12035-5. ^ Axinn, William G.; Ghimire, Dirgha; Williams, Nathalie E. (2012). "Collecting Survey Data during Armed Conflict". Journal of Official Statistics. 28 (2): 153–171. ISSN 0282-423X. PMC 3571111. PMID 23420645. ^ a b Spagat, Michael; Mack, Andrew; Cooper, Tara; Kreutz, Joakim (2009). "Estimating War Deaths: An Arena of Contestation". The Journal of Conflict Resolution. 53 (6): 934–950. CiteSeerX 10.1.1.511.6965. doi:10.1177/0022002709346253. JSTOR 20684623. ^ Jewell, Nicholas P.; Spagat, Michael; Jewell, Britta L. (2018). "Accounting for Civilian Casualties: From the Past to the Future". Social Science History. 42 (3): 379–410. doi:10.1017/ssh.2018.9. ISSN 0145-5532. the Iraq mortality survey of Burnham et al. (2006) was highly controversial and had major weaknesses (Spagat 2010), some of which led to an official censure by a professional association of survey researchers. ^ a b "Introduction - Patterns of Armed Conflict Since 1945". What Do We Know About Civil War?. Rowman & Littlefield. 2016. ^ Seybolt, Taylor B.; Aronson, Jay D.; Fischhoff, Baruch, eds. (July 11, 2013). Counting Civilian Casualties: An Introduction to Recording and Estimating Nonmilitary Deaths in Conflict. Studies in Strategic Peacebuilding. Oxford, New York: Oxford University Press. ISBN 9780199977307. In letters to the editor of The Lancet, and subsequent commentaries and peer-reviewed articles, scientists, statisticians, public health advocates, and medical researchers voiced concern about a range of technical and ethical issues, from the methods for choosing the households to be surveyed to the prac- tices used by interviewers to gather information from individuals. There were also con- cerns about the pre-war mortality rates chosen to compare with the post-invasion rates, as well as a host of other issues. ^ (PRIO), Peace Pesearch Institute Oslo. "Armed Conflict Deaths Disaggregated by Gender". Retrieved July 14, 2018. ^ a b Knickmeyer, Ellen (October 19, 2006). "One-Day Toll in Iraq Combat Is Highest for U.S. in Months – At Least 12 Killed in Fresh Attacks on Iraqi Police Facilities" Archived May 19, 2017, at the Wayback Machine. The Washington Post. Retrieved September 3, 2010. ^ Badkhen, Anna (October 12, 2006). "Critics Say 600,000 Iraqi Dead Doesn't Tally – But Pollsters Defend Methods Used in Johns Hopkins Study" Archived March 10, 2007, at the Wayback Machine. San Francisco Chronicle. Retrieved September 3, 2010. ^ Bennett-Jones, Owen (March 26, 2007). "Iraqi Deaths Survey 'Was Robust'" Archived March 30, 2007, at the Wayback Machine. BBC World Service (via BBC News'). Retrieved September 3, 2010. ^ "Right-Wingers Can't Cover Up Iraq's Death Toll Catastrophe" Archived March 9, 2012, at the Wayback Machine. By John Tirman. January 21, 2008. AlterNet. ^ PR Watch / By Diane Farsetta (March 1, 2008). "How Many Iraqis Have Really Died?". AlterNet. Retrieved October 10, 2012. ^ AlterNet / By John Tirman (July 19, 2011). "1 Million Dead in Iraq? 6 Reasons the Media Hide the True Human Toll of War – And Why We Let Them". AlterNet. Archived from the original on March 11, 2012. Retrieved October 10, 2012. ^ "The Human Cost of the War in Iraq". Mit.edu. Retrieved October 10, 2012. ^ "John Tirman: Was There a War in Iraq?". HuffPost. February 13, 2012. Retrieved October 10, 2012. ^ Tapp, Christine; Burkle, Frederich; Wilson, Kumanan; Takaro, Tim; Guyatt, Gordon; Amad, Hani; Mills, Edward (2008). "Iraq War mortality estimates: a systematic review". Conflict and Health. 2 (1). ^ Levy, Barry; Sidel, Victor (2016). "Documenting the effects of armed conflict on population health". Annual Review of Public Health. 37: 205–218. doi:10.1146/annurev-publhealth-032315-021913. PMID 26989827. ^ a b Johnson, Neil F.; Spagat, Michael; Gourley, Sean; Onnela, Jukka-Pekka; Reinert, Gesine (September 1, 2008). "Bias in Epidemiological Studies of Conflict Mortality". Journal of Peace Research. 45 (5): 653–663. doi:10.1177/0022343308094325. ISSN 0022-3433. ^ a b (PRIO), Peace Pesearch Institute Oslo. "Article of the Year – 2008 – Journal of Peace Research – PRIO". prio.org. Archived from the original on October 19, 2017. Retrieved October 18, 2017. ^ Daponte, Beth Osborne (2007). "Wartime estimates of Iraqi civilian casualties". International Review of the Red Cross. 89 (868): 943–957. doi:10.1017/S1816383108000167. ISSN 1607-5889. ^ "Retrospective two-stage cluster sampling for mortality in Iraq | WARC". www.warc.com. Archived from the original on February 10, 2018. Retrieved February 9, 2018. ^ Rosenblum, Michael A; van der Laan, Mark J. (January 7, 2009). "Confidence Intervals for the Population Mean Tailored to Small Sample Sizes, with Applications to Survey Sampling". The International Journal of Biostatistics. 5 (1): Article 4. doi:10.2202/1557-4679.1118. ISSN 1557-4679. PMC 2827893. PMID 20231867. ^ Marker, David A. (2008). "Review: Methodological Review of "Mortality after the 2003 Invasion of Iraq: A Cross-Sectional Cluster Sample Survey"". The Public Opinion Quarterly. 72 (2): 345–363. doi:10.1093/poq/nfn009. JSTOR 25167629. ^ a b c d Spagat, Michael (February 1, 2010). "Ethical and Data‐Integrity Problems in the Second Lancet Survey of Mortality in Iraq". Defence and Peace Economics. 21 (1): 1–41. doi:10.1080/10242690802496898. ISSN 1024-2694. ^ a b c d Spagat, Michael (May 1, 2009). "Iraq Study Failed Replication Test". Science. 324 (5927): 590. doi:10.1126/science.324_590a. ISSN 0036-8075. PMID 19407183. ^ a b c d Iraq Family Health Survey Study Group (January 31, 2008). "Violence-Related Mortality in Iraq from 2002 to 2006". New England Journal of Medicine. 358 (5): 484–493. doi:10.1056/NEJMsa0707782. ISSN 0028-4793. PMID 18184950. ^ a b c d e f Spagat, Michael (April 20, 2012). Estimating the Human Costs of War: The Sample Survey Approach. doi:10.1093/oxfordhb/9780195392777.013.0014. ^ a b Roberts, Adam (June 2, 2010). "Lives and Statistics: Are 90% of War Victims Civilians?". Survival. 52 (3): 115–136. doi:10.1080/00396338.2010.494880. ISSN 0039-6338. ^ "AAPOR Finds Gilbert Burnham in Violation of Ethics Code". Archived from the original on February 9, 2018. ^ Gelman, Andrew (2014). "Questioning The Lancet, PLOS, And Other Surveys On Iraqi Deaths, An Interview With Univ. of London Professor Michael Spagat". Archived from the original on February 10, 2018. ^ Gelman, Andrew (April 27, 2015). "Controversial 2006 estimate of Iraq deaths remains controversial". The Washington Post. ISSN 0190-8286. Archived from the original on February 10, 2018. Retrieved February 9, 2018. ^ Goldstein, Joshua (2011). "Winning the War on War". www.winningthewaronwar.com. Dutton/Plume (Penguin). Retrieved July 14, 2018. ^ Zeitzoff, Thomas (May 26, 2016). "Why the Method Matters". Political Violence at a Glance. Retrieved July 14, 2018. ^ "Small Arms, Crime and Conflict: Global Governance and the Threat of Armed Violence". Routledge.com. 2012. pp. 59–60. Retrieved July 14, 2018. ^ a b Burnham, G. M (July 24, 2008). "Correspondence: Violence-Related Mortality in Iraq, 2002–2006". The New England Journal of Medicine. 359 (4): 431–434. doi:10.1056/NEJMc080419. PMID 18650523. ^ Tirman, John (2011). The Deaths of Others: The Fate of Civilians in America's Wars. Oxford University Press. pp. 327–329. ISBN 978-0-19-983149-4. ^ "Correspondence: Mortality in Iraq". www.thelancet.com. 2007. Retrieved February 10, 2019. ^ Pedersen, Jon; Degomme, Olivier; Guha-Sapir, Debarati (January 13, 2007). "Mortality in Iraq". The Lancet. 369 (9556): 102, author reply 103–4. doi:10.1016/S0140-6736(07)60061-0. ISSN 0140-6736. PMID 17223465. ^ Spagat, Michael (April 13, 2018). "Fudged statistics on the Iraq War death toll are still circulating today". The Conversation. Retrieved February 9, 2019. ^ Roberts, Les; Doocy, Shannon; Lafta, Riyadh; Burnham, Gilbert (January 13, 2007). "Mortality in Iraq – Authors' reply". The Lancet. 369 (9556): 103–104. doi:10.1016/S0140-6736(07)60063-4. ISSN 0140-6736. ^ Todd, Robb S. (November 9, 2006). "Official: 150,000 Iraqis Killed Since 2003 – Iraqi Health Minister Says Three Injured for Every Person Killed Since U.S.-Led Invasion" Archived October 18, 2007, at the Wayback Machine. CBS News. Retrieved September 3, 2010. ^ a b c Hurst, Steven R. (November 10, 2006). "Iraqi Official: 150,000 Civilians Dead" Archived January 26, 2017, at the Wayback Machine. Associated Press (via The Washington Post). Retrieved September 3, 2010. ^ Staff writer (March 19, 2007). "Iraq Poll 2007: In Graphics" Archived March 20, 2007, at the Wayback Machine. BBC News. Retrieved September 3, 2010. ^ a b c Langer, Gary (March 19, 2007). "Voices From Iraq 2007: Ebbing Hope in a Landscape of Loss – National Survey of Iraq". ABC News. Retrieved September 3, 2010. ^ "The Polling Unit: Archives 2007" Archived May 5, 2009, at the Wayback Machine. ABC News. See links in March 2007 section titled "March 2007 National Survey of Iraq". ^ a b c d e ABC News/USA Today/BBC/ARD Poll Archived July 4, 2008, at the Wayback Machine. March 19, 2007. Detailed results with tables, charts, and graphs. ^ "Iraq Poll 2007" Archived April 11, 2007, at the Wayback Machine. D3 Systems poll (February 25 to March 5, 2007) for BBC, ABC News, ARD and USA Today. ^ Page, Susan (March 19, 2007). "Democracy's Support Sinks" Archived August 5, 2010, at the Wayback Machine. USA Today. Retrieved September 3, 2010. PDF report Archived August 5, 2010, at the Wayback Machine. ^ Staff writer (March 19, 2007). "Iraq Poll: Note on Methodology – National Survey of Iraq". March 19, 2007. ABC News. Retrieved September 3, 2010. ^ a b "Revised Casualty Analysis. New Analysis 'Confirms' 1 Million+ Iraq Casualties" Archived February 19, 2009, at the Wayback Machine. January 28, 2008. Opinion Research Business. Word Viewer for.doc files. ^ a b c "A Better Stab at Estimating How Many Died in the Iraq War". Pacific Standard. Archived from the original on October 19, 2017. Retrieved October 18, 2017. ^ a b "Iraq war claimed half a million lives, study finds". Archived from the original on October 19, 2017. Retrieved October 18, 2017. ^ a b Spagat, Michael; van Weezel, Stijn (October 1, 2017). "Half a million excess deaths in the Iraq war: Terms and conditions may apply". Research & Politics. 4 (4): 2053168017732642. doi:10.1177/2053168017732642. ISSN 2053-1680. ^ Spagat, Michael (2018). "Terms and conditions still apply: A rejoinder to Hagopian et al". Research & Politics. 5: 205316801875785. doi:10.1177/2053168018757858. ^ "Though Numbers Unclear, Iraqi Deaths Touch Many". NPR. Archived from the original on February 10, 2018. Retrieved February 9, 2018. ^ Cole, Juan (October 11, 2006). "655,000 Dead in Iraq since Bush Invasion" Archived February 6, 2016, at the Wayback Machine. Informed Comment (blog at juancole.com). Retrieved September 3, 2010. ^ Fisk, Robert (July 28, 2004). "Baghdad Is a City That Reeks with the Stench of the Dead" (opinion piece). The Independent. Retrieved September 3, 2010. ^ Soldz, Stephen (February 5, 2006). "When Promoting Truth Obscures the Truth: More on Iraqi Body Count and Iraqi Deaths" Archived May 4, 2006, at the Library of Congress Web Archives. ZNet. Retrieved September 3, 2010. ^ Press release (November 7, 2004). "IBC Response to the Lancet Study Estimating '100,000' Iraqi Deaths" Archived October 5, 2007, at the Wayback Machine. Iraq Body Count project. Retrieved September 3, 2010. ^ Buncombe, Andrew (April 20, 2005). "Aid Worker Uncovered America's Secret Tally of Iraqi Civilian Deaths" Archived January 1, 2007, at the Wayback Machine. The Independent (via Common Dreams NewsCenter). Retrieved September 3, 2010. ^ a b c Landay, Jonathan S. (December 7, 2006). "Study Says Violence in Iraq Has Been Underreported" Archived December 10, 2006, at the Wayback Machine. McClatchy Newspapers (via Common Dreams NewsCenter). Retrieved September 3, 2010. U.S. Military Personnel Wounded in Iraq & Afghanistan: A Running Log. "U.S. Casualties of War as Announced by the Department of Defense 2003–2007". A list of U.S. military casualties by date order beginning 2003 and updated daily. American Widow Project – Resources. "Purple hearts" – documentary interviews U.S. military casualties. In English with very short section in Dutch that is missing English subtitles. The Prozac, Paxil, Zoloft, Wellbutrin, Celexa, Effexor, Valium, Klonopin, Ativan, Restoril, Xanax, Adderall, Ritalin, Haldol, Risperdal, Seroquel, Ambien, Lunesta, Elavil, Trazodone War. February 6, 2011. By Jennifer Senior. New York magazine. USAID: We don't know how many contractors we have working for us in Iraq. "ePluribus Media has repeatedly filed FOIA requests on a range of topics related to contractors in Iraq." Les Roberts seminar at the London School of Hygiene & Tropical Medicine, on April 13, 2005; uploaded in https://www.youtube.com/watch?v=o5vD_Ub2K_c on October 25, 2006. Conetta, Carl (February 18, 2004). "Disappearing the Dead: Iraq, Afghanistan, and the Idea of a "New Warfare" Project on Defense Alternatives. Schwartz, Michael (July 6, 2007). "War on Iraq: Is the United States Killing 10,000 Iraqis Every Month? Or Is It More?". AlterNet. "Iraqi Civilian Deaths Increase Dramatically After Invasion". Johns Hopkins School of Public Health. October 28, 2004. Korb, Lawrence J.; Biddle, Stephen (September 25, 2007). "Violence by the Numbers in Iraq: Sound Data or Shaky Statistics?". Council on Foreign Relations. Kamiya, Gary (August 23, 2005). "Iraq: The Unseen War". Salon.com. The photos. "The Reach of War. A Deadly Search for Missing Soldiers". Slideshow narrated by the photographer Michael Kamber. May 23, 2007. The New York Times. Article: "As Comrades Search, Fatal Bomb Wreaks Havoc". By Damien Cave. Photo Gallery: Death and Destruction in Baghdad on Nov. 23, 2006. Der Spiegel.